The world might bombard your children with sugary snacks and unhealthy treats, but there are steps you can take to protect your child’s teeth – and their overall health – based on the relationship you create around food, especially in the home. You would be surprised how much impact you can have with the five simple ideas. Tip #1 – Make mealtime a positive experience. Eat your meals as a family and focus on conversation and sharing. Always avoid arguing or scolding your children. If meals are unpleasant, your child may try to eat faster to get away from the table and faster eating can lead to overeating in general. Tip #2 – Never use foods as a reward or punishment. Making food a reward encourages children food as more valuable and want to eat more because they’re rewarding themselves. Taking away food as a punishment can cause children to binge, because they think they might not get enough. Tip #3 – Guide food choices rather than dictate them. If you try to force your child eat healthy, they will be less likely to take ownership. Encourage them to get involved in food shopping and preparing meals. This will help them identify their own preference and make better, healthier eating choices. Tip #4 – Discourage eating while watching TV. Choose certain places where eating can occur and where eating is the focus. When your child is distracted, they are less likely to recognize when they are full, eat meals too quickly, and do a lot of unconscious snacking, possibly leading to weight gain. Tip #5 – Encourage your child to pace themselves. Explain to your child that you are trying to help them learn when they’re full. Eating slowly helps them to better detect hunger. Also, before dishing out second helpings, wait 15 minutes because your child might be full, but they might not realize it. 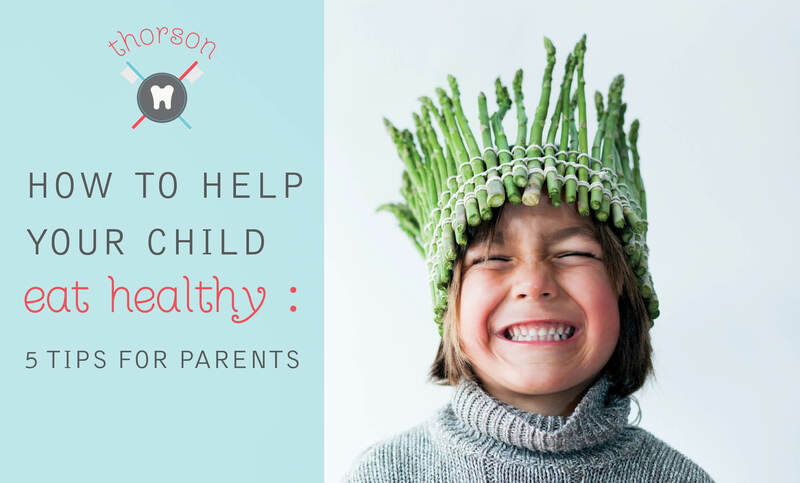 As a parent, you can make a huge impact by putting these simple things into place and set your child on the path to a healthier lifestyle where they take responsibility for their own health (which of course includes the health of their teeth). You have the power to make a real difference, creating those habits every single day.